Less than an hour ago, Fortnite's cube saga came to an end. And in short, it was crazy. But beyond providing for an epic moment for Fortnite players to all participate in live, it also brought with it some map changes. For one, the Floating Island is gone, and so is the massive, mysterious cube (Kevin). In it's place, Leaky Lake has returned, and is boasting a whole new look. Of course, these changes to Leaky Lake are more than aesthetic. They will impact moment-to-moment gameplay. Leaky Lake is now far less water and far more land, which should mean more players will frequent it. Back in the day, Loot Lake was risky. Sure there was an island in the middle that offered decent loot, but crossing it was dangerous. You either had to slowly trek through the water and hope a sniper didn't see you. Or draw a ton of attention to yourself by building across it. And as a result, players largely avoided it. But now there are more islands and places to build and take cover, so navigating it shouldn't be as tactically risky as it used to be. 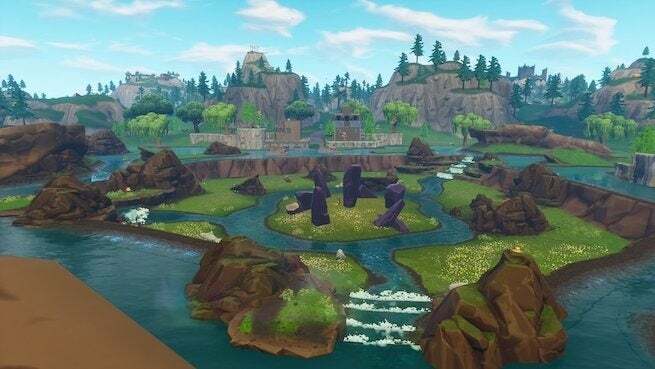 Interestingly, in the early days of Fortnite, fans pleaded with Epic Games to make Loot Lake less lake by adding more islands. And now, months later, that has happened. Suffice to say, players are pleased with the changes. Other players have pointed out the part of the map now looks more like Moisty Mire, which was destroyed a couple of seasons ago, much to the disappointment of many. However, Moisty Mire was wood heaven with all of its massive trees. The new Leafy Lake hardly has any trees, or any building materials at all, really. Anyway, feel free to hit the comments section and let us know what you think of the changes made to Leafy Lake.